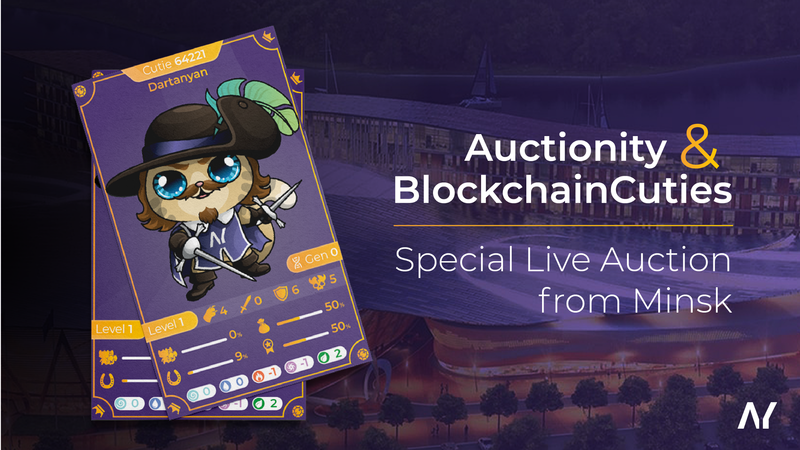 As announced in our March Monthly News, Auctionity and Blockchain Cuties are partnering for a special auction sale which will be held live from Minsk on April 25. An event not to be missed! At Auctionity, we believe that partnerships are essential to the development of Non-Fungible Tokens and the achievement of broader adoption. We are always adding new NFT categories to the Auctionity Saleroom and connecting with other major players of the Non-Fungible community. Our previous partnerships with Etheremon for the Lunar New Year and with KnownOrigin for a Creative Challenge are but a few examples of our endeavors to reach out and build bridges within the community. We have recently added Chibi Fighters and Blockchain Cuties as new categories on the Saleroom and are planning to add KnownOrigin digital art soon. 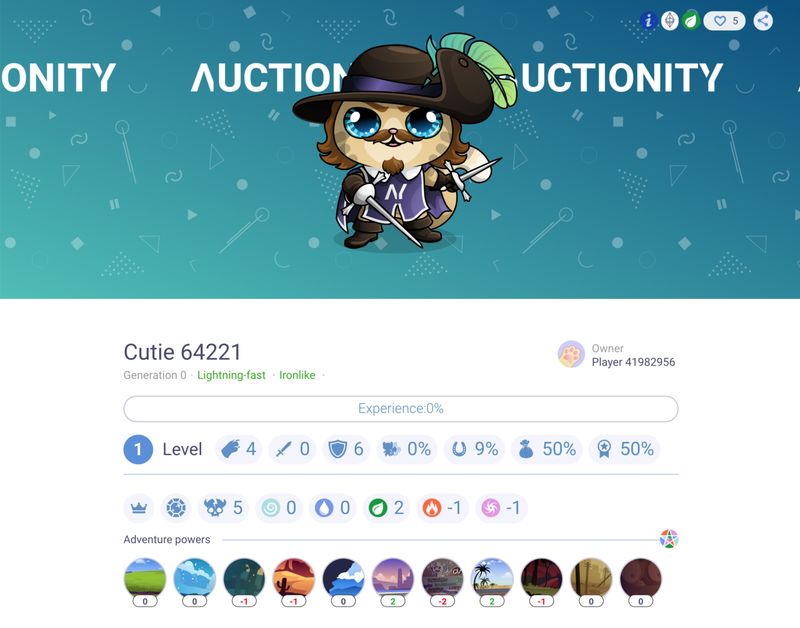 To celebrate its new partnership with Auctionity, Blockchain Cuties has issued a unique and absolutely one-of-a-kind musketeer Cutie. Indeed, we French 🇫🇷are known for The Three Musketeers, a novel by Alexandre Dumas, so this is pretty fitting! The sale will also be held live from Minsk and animated by our partners on site. All the proceeds of the sale will be given to the TeenGuru program initiated by the startup hub Imaguru of Minsk. The objective of TeenGuru is to provide kids and teens with a chance to start their own IT-project, acquire entrepreneurial skills and learn about new technologies (such as blockchain). You can find out more about this exclusive Cutie and all its stats on the official Blockchain Cuties website. One-of-a-kind Gen0 Cutie with awesome musketeer attire! This special sale is one more demonstration of our concept. Our goal is to make decentralized auctions the standard way of holding live auctions. The aim for us is to offer an experience that is seamless for the user while creating a bridge between brick-and-mortar salerooms and the digital world. This event is a perfect illustration of Auctionity’s vision for the future of auctions: 2 (or more!) auctioneers in different locations animating the same sale on a fully decentralized platform. We want users to enjoy the benefits of decentralized auctions (speed, security, payment guarantee) without the need to understand how blockchain works. We want to connect decentralized auctions to real-world applications and Auctionity is one way of doing so. The whole team at Auctionity is very excited about this special sale that could very well be the stepping stone to some even bigger events. We are hoping to continue our successful relationship with Blockchain Cuties way past this special auction and this event is only one of the building blocks that will eventually lead Auctionity to its goals. We hope you enjoyed reading this article. If you found it useful, then feel free to share it and spread the word. In addition, you can sign up to our newsletter to receive a roundup of our latest stories. Make The Deal • Making auctions safer, faster and more dependable through blockchain technology to decentralize and secure auctions at a world level.